Spread the word and help raise awareness. Watch and share our Great Strides 2010 video on YouTube. Join our Great Strides 2010 Facebook group. 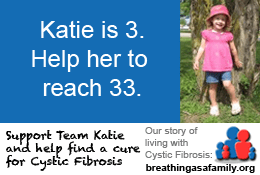 Thanks for helping us raise awareness for this important cause! Let’s make this year an even better one!! If you are unable to make a financial donation, please consider our family in your thoughts and prayers. 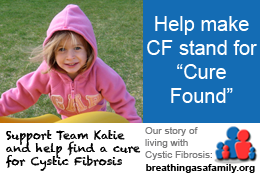 Cystic Fibrosis is something that we deal with on a daily basis. It is these fundraisers that give us tremendous hope for the future!